An ice cube in a pint glass demonstrates how the shrinking polar ice cap gives more flow to a stronger Gulf Stream, while an ice cube in the adjacent pint glass demonstrates why Gulf of Maine seawater is not warming faster than any other water body. 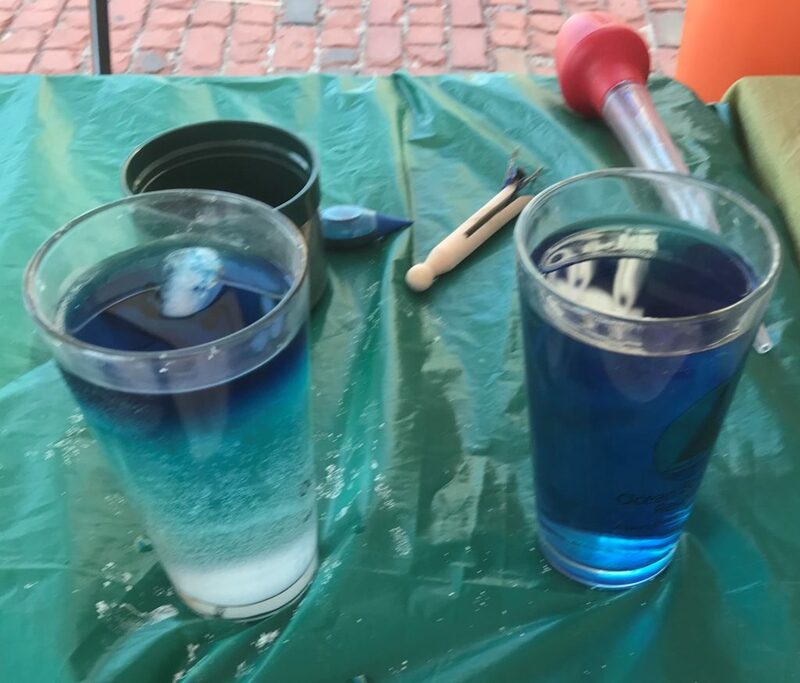 On the hot bricks of Boston’s City Plaza at the 11th Annual Boston Greenfest where air temperatures climbed into the nineties, the intent was to demonstrate how ocean currents circulate around the Atlantic Ocean with a pint glass, water, salt, a single ice cube to play the part of an iceberg, and a splash of blue food coloring. 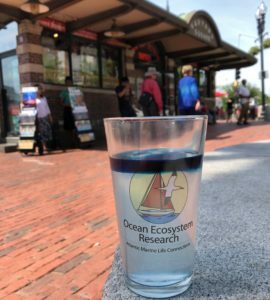 Beneath the Ocean River Institute banner, two pint glasses of fresh water were set out on a green plastic table cloth. Salt was poured into one glass and stirred. A single ice cube went into each glass. One drop of blue food coloring was placed on top of each ice cube. Festival goers leaned forward or squatted a bit to see horizontally into the two glasses. Blue dye in the glass of salt water puddled around the ice cube on the surface. The glass of fresh water drew everyone’s attention as feathery streams of dark blue dye cascaded off the ice cube down to the bottom of the glass. If this is all fresh water why is the blue water sinking so fast, I asked. The answer was that melt water off the ice cube was colder and therefore denser than the rest of the water. Denser water sinks and sinking water is what drives the ocean’s currents. I held up a map of the Arctic Ocean above the Greenland Sea to illustrate. During the summer two-thirds of the Arctic was once covered by ice. Now it is much less, the ice cap covers only about a third of the Arctic Ocean. With twice as much open water, come winter there is twice as much freezing of seawater and twice as much formation of sea ice restoring the ice cap. When sea water freezes the salt is left behind. Just below the newly formed sea ice is the saltiest and coldest water, which begins to sink. It is this sinking of cold and salty water that drives the ocean currents around the globe in a process called thermohaline circulation. More nutrient rich water is flowing out of the Arctic and into the Atlantic Ocean. 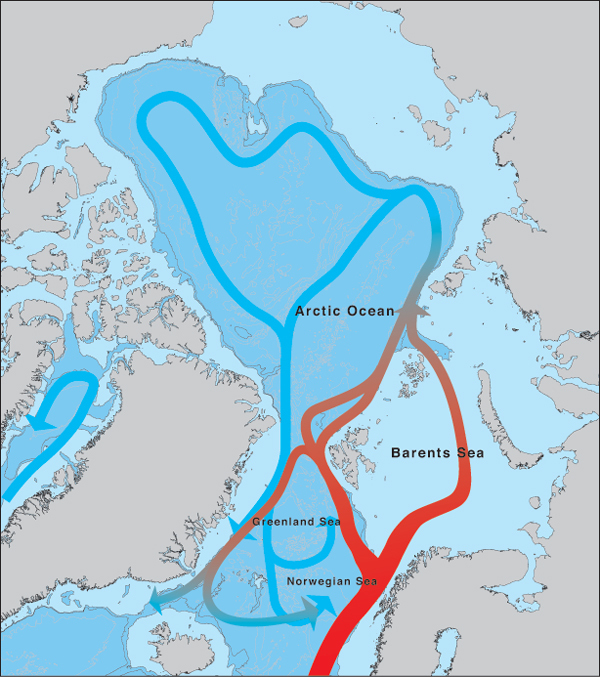 In the Denmark Straits between Greenland and Iceland, Arctic water crashes into warmer less dense Atlantic water. The cold water current falls 11,500 feet at 175 million cubic feet of water per second. That’s about 2,000 Niagara Falls plunging three times the height of the world’s tallest waterfall. This intermediate water becomes the nutrient-rich Labrador Current barreling towards New England. More freezing of seawater at the North Pole becomes more water in the cold Labrador Current that brings more nutrients to support marine life in the Gulf of Maine and on Georges Banks off Cape Cod. The Gulf Stream was observed to be flowing with more energy in 2011 as it meandered up onto the Continental Shelf and closer to Rhode Island than ever before. Just as train cars go every which way when there is a crash, currents meander to dissipate excess energy. A less subtle indication of stronger Gulf Stream flow was in the Svalbard archipelago on the threshold between the Atlantic and Arctic Oceans. Svalbard used to be the end of the road for the Gulf Stream. That is until 2007, when the Gulf Stream surfaced and came into the fjords causing ice on the land to commence melting. More Gulf Stream carrying more heat from the south to Northern Europe is fueling this summer’s record temperatures. Warm Atlantic water is passing Svalbard to circulate counter-clockwise around the North Pole. This warmer intermediate water is giving up heat to the surface waters. During summer heat from the Atlantic is furthering accelerating the melt of the Arctic ice cap. The positive feedback loop of ice cap melt is closed. During my map talk the eyes of some children stay glued on what was going on in the two glasses of water. A boy of about ten years old observed that one ice cube is now much larger than the other, roughly three times as big. He pointed out that the bigger cube was riding higher in the water on top of salt water than the cube in fresh water. The ice cube was not dense enough to depress the salt water. Touching the fresh water glass on this very hot day, the glass felt cool. The glass of salt water felt warm. Except for the blue top layer which felt coldest of all. Here the ice cube lasted ten minutes longer than the other because it was only cooling the shallow water around it. The ice cube in fresh water expended itself quickly cooling the entire glass. This phenomena of stratified water thermodynamics led researchers to believe the Gulf of Maine was warming faster than any other water body, faster than the waters of Chesapeake Bay or the Gulf of Saint Lawrence. They recorded temperatures of the surface waters during summer, without a look below the sea’s surface. The misconception of seawater warming faster in the Gulf of Maine is much a like swimmer who dips toe in to determine water temperature, then dives, only to emerge gasping. The warm surface water gives no indication of how cold the layer below will be. What the ice cube in a pint glass of salt water told us is surprising because we know water conducts heat. When wet, one cools off faster than when dry. Ice cubes in a cocktail glass cool the entire drink. The ocean is more complex with different water bodies defined by density, salinity and temperature, moving about. Nonetheless, the principles of thermohaline ocean circulation can be found in a glass of water with ice, salt, and a drop of color. 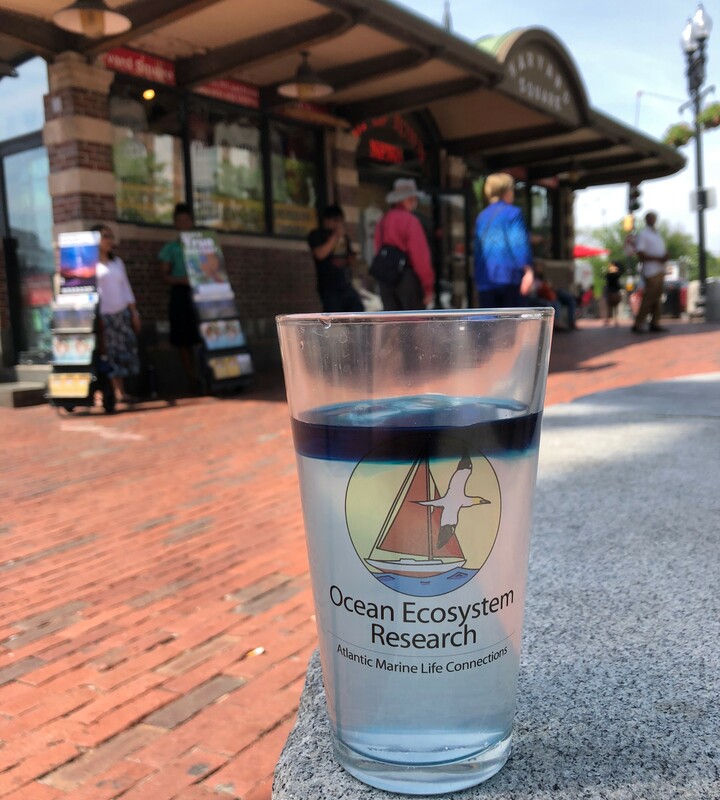 While readers of an esteemed science publication may believe the waters of the Gulf of Maine are warming faster than other water bodies, people with hands on pint glasses in Boston’s City Plaza discovered surface water temperature has no relation to the temperature of the water body below. Watching the cascade of blue water from an ice cube, and thinking outside of the polar ice cap, resulted in understandings of the ocean mechanics making the Gulf Stream flow stronger due to global warming. Great article. Possibly a few more charts for us lazy people. excellent work. the cause of the artcic ice melt is the delta H of the stronger gulf stream (2030 – 1730) when ben franklin studied it. ice melt is not a magic phenomen. when delta H is provided, the ice melts or if a negative delta H is provided, it condenses. continuing the process will result in finally steam being formed from the delta H. the cause of artcic ice melt is florida === ie the gulf of mexico which provides the heat. Good article . However , ocean currents are primarily driven by global wind circulation . The gulf stream is the result of thousands of miles of easterly trade winds ceaselessly blowing over the atlantic ocean until it is blocked by the american continent . Coriolis force insures it will turn to the right up the east coast . Similarly the agulhas current on the east side of africa and the kyushu current in the north pacific . All the worlds ocean currents are the result of global wind patterns . This isnt to say in any way that thermohaline movements dont also have their effects , as well as coriolis . True. However, why is the Gulf Stream flowing stronger and the Arctic ice cap melting faster? The global wind circulation is not increasing because it is tied to the rotation of the Earth, and that’s not turning faster. To answer that one must look below the surface, beyond the top 10% of the ocean. And that is what this article is about. I present an oceanographers perspective on what we have done to this planet.